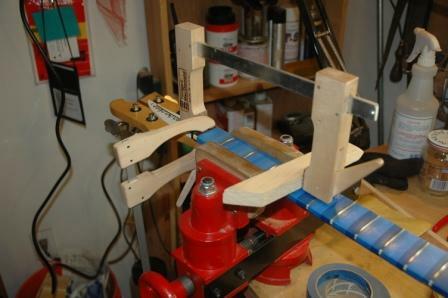 I completed the fret dress on the Rickenbacker bass. It cleaned up real nice. 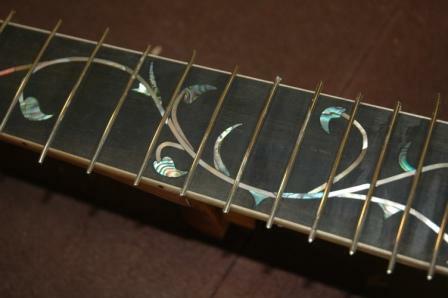 The frets were pitted in several positions from the 3rd up through the 9th frets. 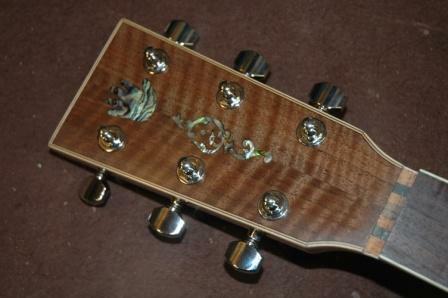 I was able to dress down the frets leaving only one small deviation. 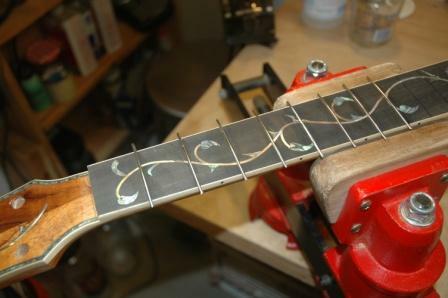 These frets are now down as far as they should go before a refret. 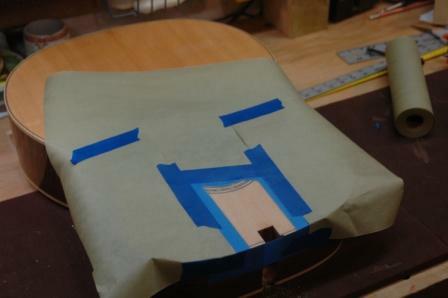 After filing the frets, the fretboard is protected with tape. 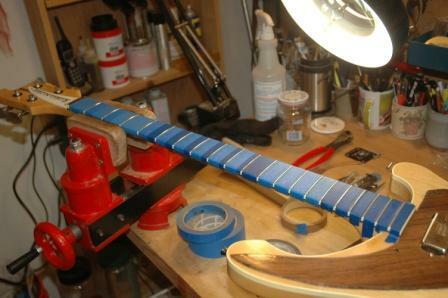 Each fret is then sanded and buffed. The nut was removed prior to filing. 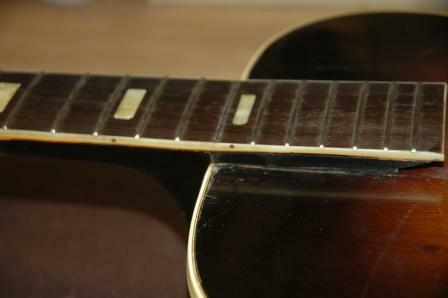 The nut is glued (lightly) back in place after the frets have been polished. New strings were strung, took it for a test drive, and it’s a fine result. 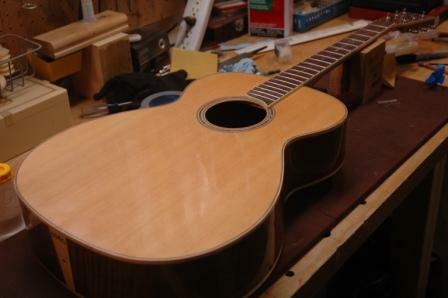 I finished sanding and buffing the finish and moved on to fret install. 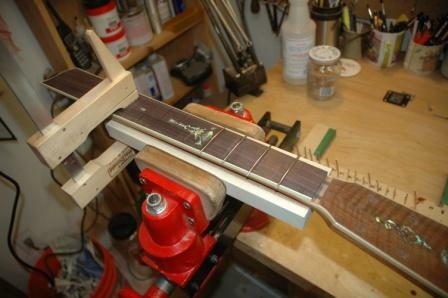 I’m installing up to the 13th fret, dabbing a little water and white glue into the slots and pounding the frets in on the vise. I was a bit worried about the lacquered binding and the inlay, but both held up very well under mad hammering. 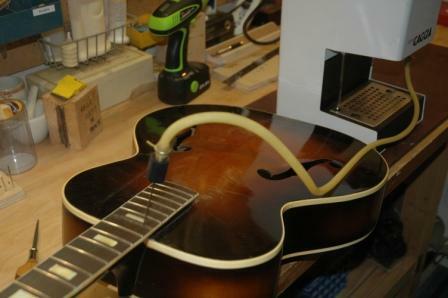 I installed the tuning machines as well. 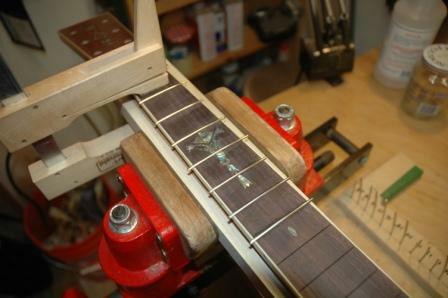 I need to devise a secure surface to pound in frets 14 through 20 so as not to flex or break the fretboard overhang. Tom donated a semi-operational espresso machine which produces steam but no espresso. I rigged up a hose and needle and use it to free up the glued dovetail joint in the neck. 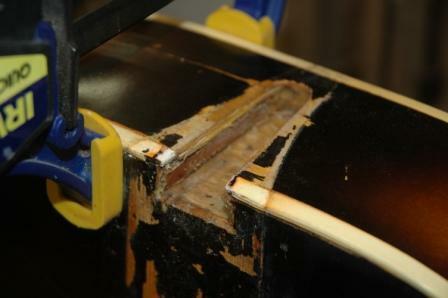 Two holes were drilled at the 14th fret into the cavity where (hopefully) the dovetail joint resides. It’s a bit of a crap shoot not knowing the width of the dovetail, but as luck would have it, I drilled into the cavity first time through. 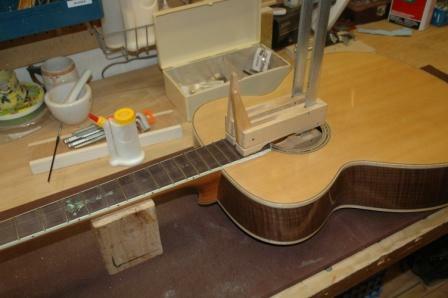 It took quite some time to steam this sucker loose, as the previous neck reset was overglued (neck heel to body, bad jujus). 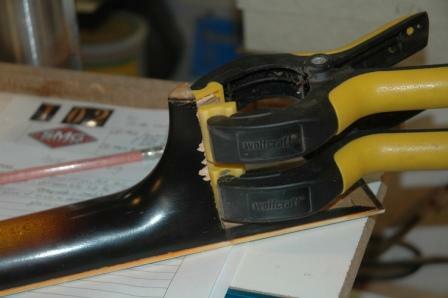 Some damage was done to the neck heel and the sides, but cleanup and fill will mask the damage. The previous neck reset added extra wedges underneath the fretboard moving it farther away from the body, and a whole lot of shims. I chiselled out all the excess shims and wedge under the fretboard and glued on two new shims, a bit oversized, but ready to be shaved down until a fine fit is achieved. I’m doing this repair for a colleague who bought it on eBay. Seller claimed it was “only a finish crack”. Right. 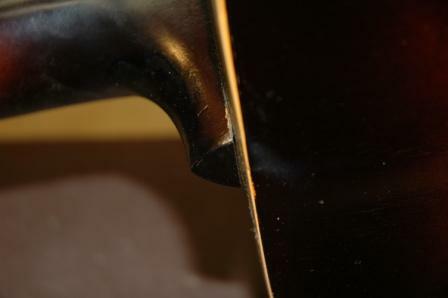 The guitar obviously fell face first and the neck blunt forced the body into two cracks from the neck joint down through the body about two inches. I’ll need to remove the neck, clean up the cracked finish, then glue and clamp the cracks. So first, remove the neck. Simple, 4 screws released, then neck pops out. 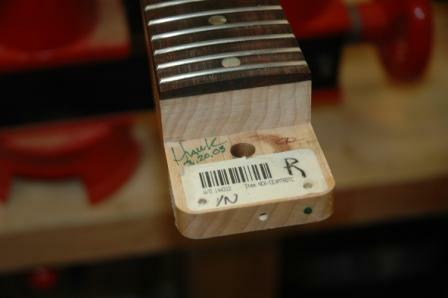 Neck has a tech’s signature and date of 3.20.03. The cracks start at each side of the neck well and go down the back about two inches. 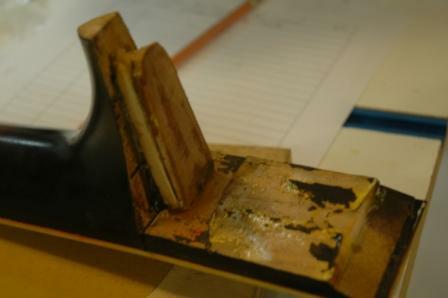 I applied CA glue to the back cracks, turned over then flooded the neck well with CA glue in the corners, then clamped. 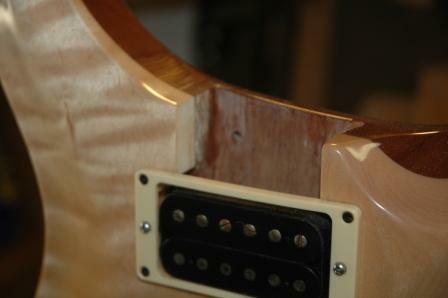 While this was drying, I removed the bridge pickup to fix a loose adjusting screw. The screw which adjusts the height of the pickup became unseated, so it just needed to be reattached. 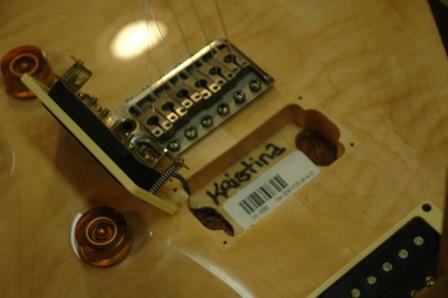 Kristina is either the tech who installed the pickup, or the previous owner’s girlfriend wanted to mark his guitar. 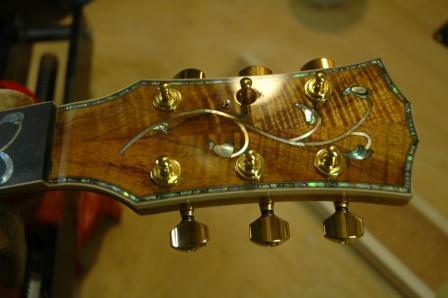 Next, fill the cracked lacquer, sand, polish, then bolt the neck back on. This little monster is going to take some effort. 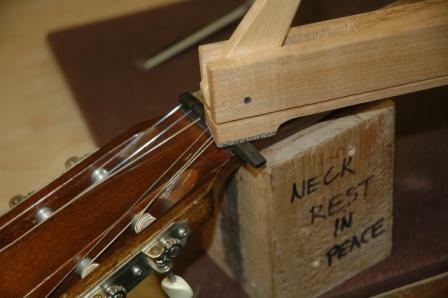 A previous neck reset was done and a block was augmented or inserted between the body and the fretboard. It’s too thick, it’s not uniform, and I suspect I will need to remove it and determine what kind of replacement block is needed. 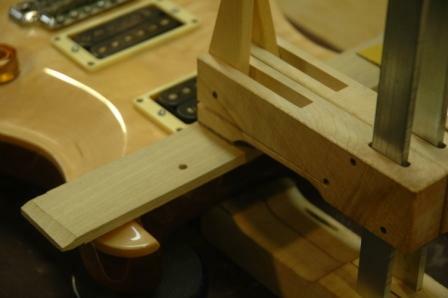 The heel is coming away from the body, so to correct the neck angle and devise the right dimensioned block under the fretboard, I’ll need to steam this sucker off. I quoted a “not to exceed” price to the customer, and I may have bit off a bit more than what I can get for this job. I should have gotten this one out of the way a long time ago. 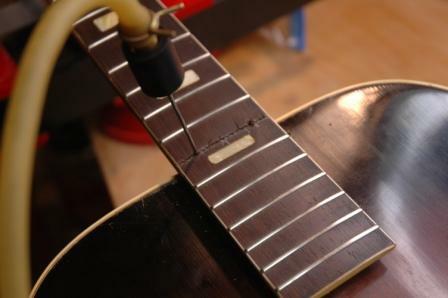 It’s a small job, fix ebony nut by repairing missing piece on the low E side. I cleaned up the surface and glued on an oversized piece of ebony. 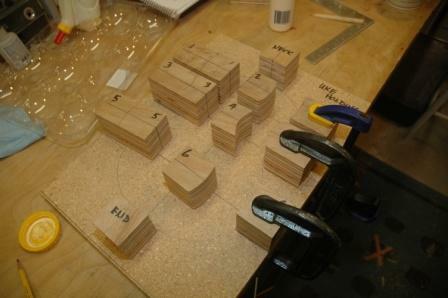 Once this has dried, it’s a simple matter of trimming and smoothing. 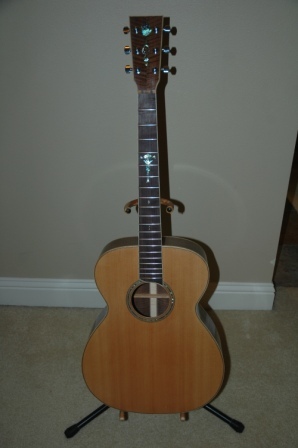 To wrap up, I need to straighten a bent tuning peg, then Larry can have his Classical guitar back into inventory.